This cross country mountain bike training plan is designed for a Beginner or Cat 3 mountain biker and is both Heart rate and Power training compatible. If using Power you will be tested both in the 1st week and also the 6th week in this program to measure your progress and make sure you zones are set up correctly. This 2 month mountain bike training plan will work on building your Base. The major focus of this plan is to get your body prepared with a great foundation to build on for racing season. The main focus is on longer rides, sub threshold work, and muscular force work. The training plan starts with small build of mainly volume in the first month with introduction to some intensity as the month goes on. In the second month, more intensity is added in along with more specific work to prepare you for your Build program which follows this. You will need access to a heart rate monitor and/or power meter and will need to know how to use it. You can do the training on a road or mountain bike. If training with power, you will get an introductory document that gives you tips on how to train better and more effectively with power. With this program you will also receive nutritional information, a detailed description of heart rate zones, and a start-up guide that introduces you to interval training. Today is an easy ride. Do not over do it! Tomorrow will be tough, and this ride will make sure you are prepared for the hard ride tomorrow. RPE for this ride should be a 3-4 out of 10(see attachment with start up for basics on RPE). BT: Warm up with 20 minutes of easy to moderate spinning. Then ride a 30 minute time trial on flat course. Punch HR monitor 'lap' button 10 minutes into Time Trial. Average heart rate for last 20 minutes predicts Lactate threshold heart rate (LTHR). Follow the instructions in the attachment that came with your program purchase for details on what to do with this number. Ride Zones 1-2 only today. Within the ride include 20 minutes of one legged work, where one leg does 90% of the work while the other leg "loafs". While perfoming this drill, attempt to push your toes to the front of your shoe at the top of the pedal stroke, and scrape dirt off your shoes at the bottom of the pedal stroke. Attempt to eliminate all dead spots and become more efficient! Ride Zones 1-3 off road. During this ride focus on "flowing" through the trails. Look ahead and into the trail, brake before/after and not into the turns, and think/plan ahead. Ride mainly Zone 1-2 for 30 minutes. Follow this with 30 minutes building to Zone 3. Use a comfortable cadence(80-90 rpm). Rest of time ride in Zones 1-2 with most of that time in Zone 2. Ride Zones 1-2 inlcuding 3-5 x 30 second accelerations to Zones 3-4. Take 2 minutes rest between each effort. These should not be extremely hard. Save your energy for the harde workouts later in the week. Warm up well with 20-30 minutes of spinning and 3-4 x 60-90 second accelerations to Zones 4-5. Follow this with 1 x 20 minute intervals building up to Zones 3-4. Within the 20 min interval criss cross from Zone 3 to Zone 4 every 2 minutes(i.e. start the interval aiming for zone 3 and hold for 2 minutes, then switch to aiming for zone 4 for two minutes, repeat throughout the entire 20 minute interval). Finish off with easy spinning in Zone 1 only. Mountain Bike Coaching and Training Plans. 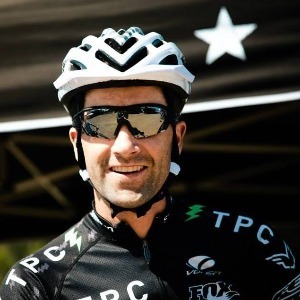 My name is Drew Edsall, I am a mountain bike head coach with Mtbfitness.com and also a former professional mountain biker. At Mtbfitness we work with all mountain bike athletes and specialize in mountain bike one on one coaching, and mountain bike specific training plans.